Get updates on the Badgers-Gophers game from Star Tribune staff and others on social media. It was a second-half team, & @PennStateFball showed it in the 2016 #B1G title game. One week until the @B1Gfootball title game x @Discover . #Gophers , thank you for your continued support all season long! ???? The Game had drama and intrigue, as usual. "Our goals are still in front of us"
Tito Odenigbo was ejected for tossing the flag back at one of the refs. We'll live tweet updates from the post-game press conference. Stay tuned. Final 31-0. 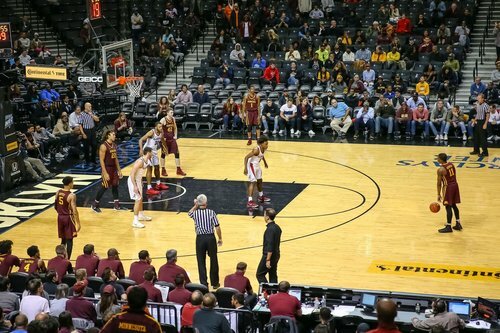 The gap between these teams is like the Grand Canyon. Final from TCF Bank Stadium. Minnesota punt. Wisconsin's offense gets the ball back with QB Jack Coan. Wisconsin punt. 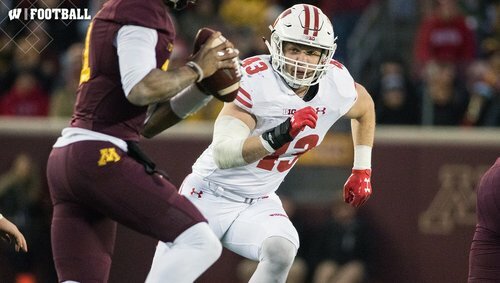 Badgers' defense back on the field. #Gophers force a punt on fourth down. Offense will start 1st and ten on their own 12-yard line. Hey @UWBuckyBadger , @GoldytheGopher doesn't make the rules. He just enforces 'em. ???? Now hit the bricks! ???? Minnesota misses another long field goal! Turnover on downs. Shutout still intact. Carpenter with a a 48-yard FG attempt. No good. Rodney battled on that drive and is up to 82 yards rushing today. This man @23J_Taylor is having one of the best freshman seasons of all time. 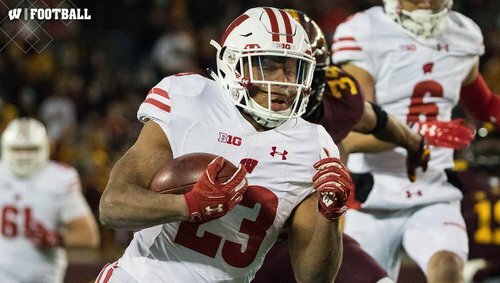 He makes it look easy on this 53-yard house call, and @BadgerFootball is making it look easy against the Gophers. Gophers offense is close to crossing that mythical threshold of 100 total yards. Jonathan Taylor 53-yard TD run on first play of fourth quarter. 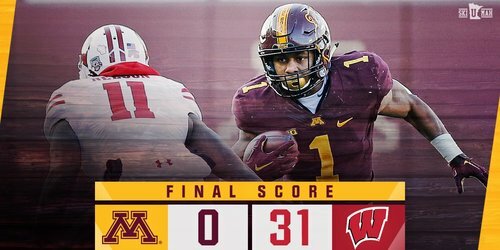 Wisconsin leads #Gophers 31-0. Fourth quarter about to begin. Wisconsin leads #Gophers 24-0. On to the fourth quarter! 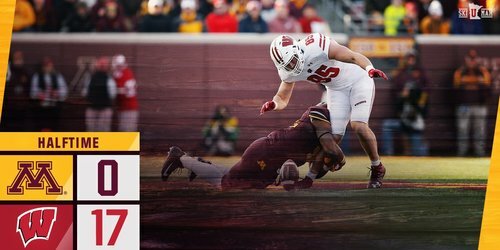 #Badgers continue to make it difficult for Minnesota, as the Gophers punt it back. 1st/10 Wisconsin at the WIS 30. Kobe pounds forward on fourth-and-short for a #Gophers first down. 1. 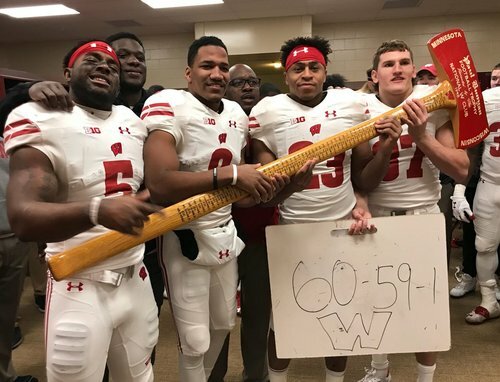 How did Alex Hornibrook stand in there and deliver that ball? 2. How are Kendric Pryor's mittens so good as a freshman?? Hornibrook 6-yard TD pass to Danny Davis extends Wisconsin's lead to 24-0 over #Gophers with 6:06 left in third quarter. #Gophers down 24-0 with 6:06 left in the 3rd quarter. 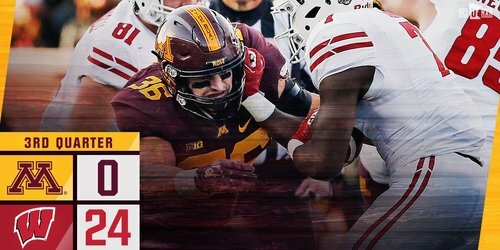 Wisconsin on move again in third quarter with Hornibrook's 31-yard connection to Pryor to the #Gophers 11. Ryan Connelly with his second sack of the game for a 12-yard loss! #Badgers defense comes up with another stand. Minnesota punts. Will Reger! His first career catch goes 26 yards to the Wisconsin 33-yard line! McCrary plunges for seven yards and a #Gophers first down early in the second half! #Gophers will receive to start the 2nd half. #Gophers will receiver to start the 2nd half. Johnathan Lewis ➡️ Raheem Blackshear = @RFootball TD. Not too bad of a half for Alex. ???? The #Gophers still trail as we enter half.